So I've steadily kept up with the various expansions for Imperial Settlers as it truly is an awesome game. It has a great balance of strategy and luck and quite an amount of game diversity because of the different factions. At the end of the day, it's a really fun game. These Empire Packs are quaint little expansions that help add a twist to the game play so that it's familiar but still different. And that's when expansions really work well - when they add enough to be different without restorting to overly out of the box solutions that border on being silly or a different game entirely. 3 Is A Magic Number is a fun addition to the Imperial Settlers line that nicely expands on things with another simple yet kind of brilliant game mechanic. In this way I end up loving these little Empire Packs a bit more than the faction expansions. But maybe I'll change my mind once the Amazons expansion comes out. Only time will tell. Synopsis: Imperial Settlers: 3 Is A Magic Number is an Empire Pack expansion for Imperial Settlers also designed by Portal Games main man Ignacy Trzewiczek. The game includes new cards for the Common deck along with supplementary cards for the 5 prior released factions. The main new rule from this expansion is that of Sets. In a nutshell, these are different abilities that are tied to building cards of a particular color. When you have 3 cards of a color built, then the set ability will trigger. It's sort of like how the Romans score with some of their unique buildings and multi-colored cards but on a wider level. The trick about sets is that you typically start counting them at the point of when you build the card that mentions sets. Sadly this means ignoring cards of the target color that are already in play but the overall benefits are still worth it in the end. And no, the game is not overly skewed in favor of the Romans. But they do have a bit of a leverage. What I Liked: Sets are such a simple mechanic but almost elegant in their simplicity. And as the card colors have always been there, it's nice to give it more benefits apart from the isolated Feature cards that have sprung up here and there. This makes all of your cards a lot more valuable provided the right set-trigger cards come along in time. And I must say that the art on these things are just adorable. Sure it's consistent over time but with each new expansion we see new ways that they try to have the different factions intermingle on the cards themselves. That humor is a lovely part of the game and you really need to take a closer look at these cards. And hooray for expansion symbols that help sort cards! What Could Have Been Better: The mechanic related to pre-existing cards not being part of the set is probably necessary for game balance but not quite as fun in practice. It's a little tricky figuring out how to sort through things and the system of marking these set cards with face down common cards is quirky but functional enough I suppose. It's a little tricky to see how things balance out between the factions as we know each faction tends to favor certain colors significantly. Japan obviously has a lot of red cards and the Egyptians had a fair amount of grey and gold cards. How it fleshes out may depend on the player but it doesn't quite always get positive results. 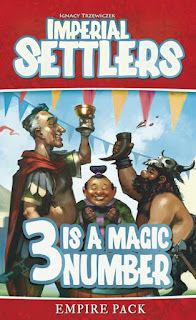 TL;DR: Imperial Settlers: 3 Is A Magic Number is still a solid new expansion for the game and one that has a pretty fun mechanic. It does make sense that they went in this direction given what they later did in Aztecs, but I'll address that in a later expansion. Thus the game gets a fun 4 quirky set powers out of a possible 5.